Who’s ready for warm weather and sundresses? Madeleine sure is! Summer is the perfect time to replace your jeans and leggings for easy, breezy pieces. Madeleine is ready for a day of sunshine in this darling gingham summer dress. This black and white gingham dress is a dream to wear on a balmy day. The soft material is the perfect fabric for any girly-girl out and about this summer. The delicately ruffled sleeves set this dress apart from all the others on the racks. Sandals are another summer essential — no one likes a sock tan! These bejeweled flat sandals from Nordstrom Rack are a stylish complement to Madeleine’s feminine dress. They’re so pretty! Madeleine’s watch and bracelets were inherited and she wears them year-round. The mixed metals and shiny stones in her rings add a fun touch to her look. 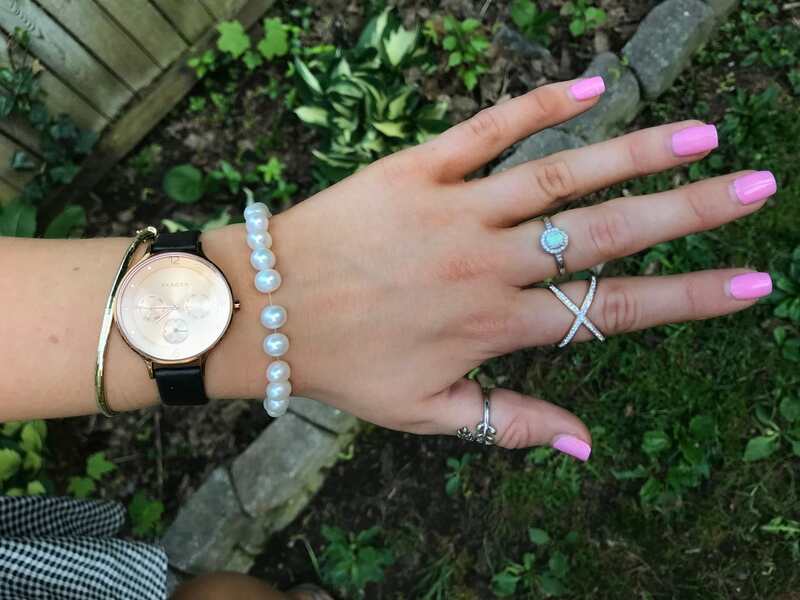 These delicate pieces look great with Madeleine’s bright summer manicure. Are you a summer dress fan? Would you wear Madeleine’s fun sandals and funky jewelry? We want to know what you think, so leave us a comment below!